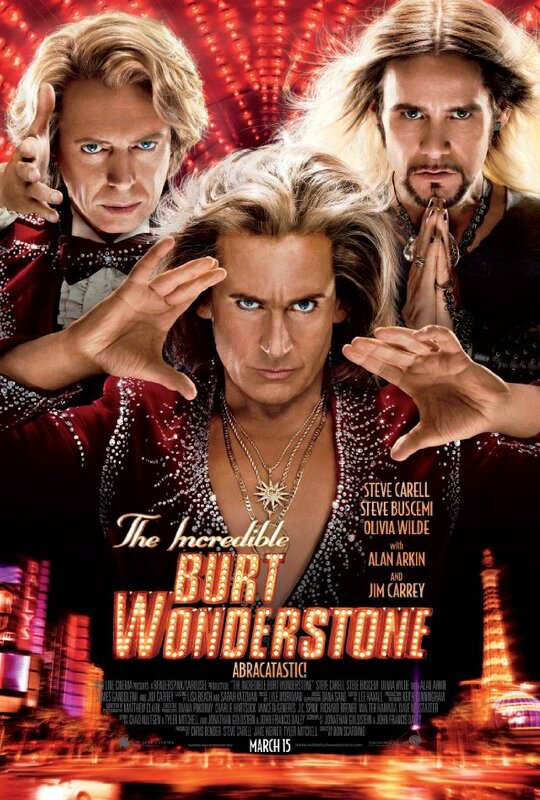 Burt Wonderstone (Steve Carrell) and Anton Marvelton (Steve Buscemi) are the hottest act in Las Vegas. A “magical friendship” that started when they were kids. Neither were popular. Both bullied. Burt won Anton’s friendship by doing magic tricks he learned from the Rance Holloway (Alan Arkin) magic kit he received as a birthday present while his mom was at work. The show would sell out every night. They had been doing the same show every night for 10 years. Burt had lost his love of magic. It was now a means to get women. After losing countless assistants, Jane (Olivia Wilde) is made to fill in. She had been working backstage at the show, so she knew all the tricks. As an aspiring magician herself, Burt had been her idol for a long time now. When Steve Gray (Jim Carrey), a Criss Angel type magician, comes to town, things start to go south for the magical duo. Magic had evolved. Burt and Anton had not. Steve’s extreme acts were depleting Burt and Anton’s audience. Doug Munny (James Gandolfini) warned the duo that if they didn’t change their act, they wouldn’t be performing at his hotel anymore. During a less than spectacular event, the “Hot Box,” Burt decides, and announces in front of a large audience that he doesn’t need Anton or Jane anymore. He can do the “Magical Friendship” act on his own. It doesn’t go so well. After his act is canceled and he is kicked out of the hotel, Burt is taking any and every magic gig he can to make ends meet. He ends up “entertaining” the folks at a retirement home where he learns he must rekindle his love for magic. This is his only hope for winning back his place as the top act in Vegas against Steve. It’s the often told story of self-redemption. A superstar’s ego getting the best of him, alienating his friends, hitting rock bottom, then crawling his way back up. It plays to the same formula you see in every movie of its ilk. With a cast like this, it has the potential to be hilarious. Steve Carrell, Steve Buscemi, and Jim Carrey could do such great things. Throw in Olivia Wilde, and it’s sure to be great. Unfortunately, it doesn’t quite live up to its potential. Don’t get me wrong, it definitely has its moments. The “Hot Box” being one, and the scene just before the ending credits being, by far, the funniest scene. But there were many times where I felt unsatisfied. There is a scene with Burt and Anton that attempts to recreate the spontaneous hilarity of Bruce Almighty, where Bruce forces Evan Baxter to babble incoherently during a news broadcast. I remember laughing out loud, uncontrollably, in the theater during this scene. There was amazing chemistry between Jim Carrey and Steve Carrell in Bruce Almighty. A chemistry that is lacking in The Incredible Burt Wonderstone. Don’t get me wrong, though. It’s not a bad movie. It’s just not as good as it could have been. It does a great job of capturing the cheesiness and quality of showmanship that I can only imagine goes into a Vegas magic act. Like I said, it does have its moments. Jim and the Steves are funny. The just feel disconnected. And Olivia Wilde, well, she’s Olivia Wilde. Nothing to complain about there. I have to give a nod to Jay Mohr who steals the first scene he’s in. The movie could have benefited from giving him more screen time. If you’re looking for a movie to see this weekend, this isn’t the worst choice you could make. I would just recommend waiting for it to come to your local RedBox.